International training camp for karateka from all (full contact) organizations. Specific training for all participants, from 10th kyu to 4th dan, on their own level. Special groups for instructors/senseis, for youth, for ladies and for (inter)national fighters. Shihan Jan Bülow, 6th dan, Denmark. Member of EKO technical committee, expert in kata and preparation for grading, considered one of the best instructors worldwide. His experience spans training and teaching for more than 40 years and in tens of countries around the world. Shihan Jan is a multiply international champion, still active as a fighter and very successful in (veterans) tournaments. Shihan Jan Bülow known for his strong spirit and never give up! 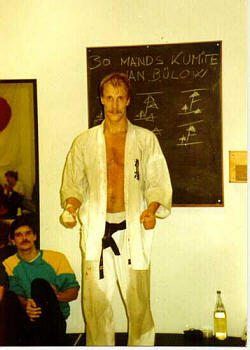 Picture from his 30 men Kumite to 3rd Dan in 1988. Same year he become Danish Open Champion, as he did the year before. Picture from Roskilde Karateclub Denmark. Sensei An Driesens, 3th dan, from Belgium, living now in Switzerland. Having won many international titles as a fighter, sensei An is the reigning European Champion in kata. She is considered one of the best kata-experts worldwide. Apart from this, she is known for her successful allround instructing of girls and ladies karateka, from young to old and from inexperienced to champion level. Fresh off Diamond Cup win! 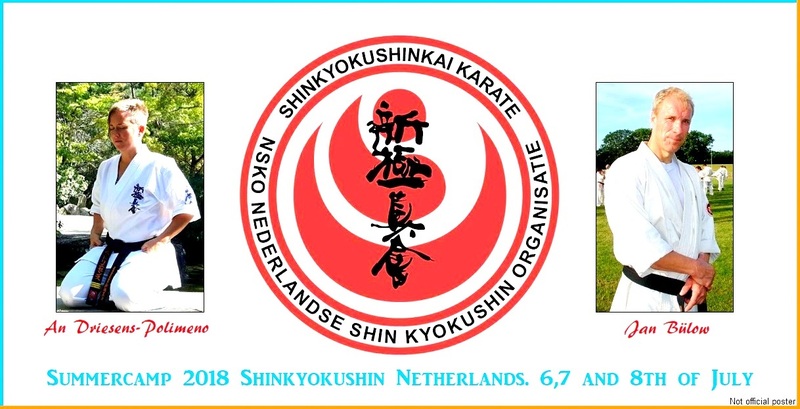 In addition to the foreign instructors, Dutch international instructors will be present. Amongst them:- Koen Scharrenberg, Gilbert Cleveringa, Richard von Mansfeldt, Patrick Stegenga, Chiel van Vliet, Tristan Thiele (coach national team the Netherlands) and others. – Preparation for examination, with highly qualified instructors. In groups, if necessary on individual basis. – Randori and kumite training. Sparring and fighting training in groups of same experience. Later sessions: also mixed with higher degrees and mixed with international fighters. Based on (shin)kyokushin values: kohais (lower degrees) can absolutely trust sempais and senseis, to help them grow stronger, without fear for being hurt, creating mutual respect. – Ladies groups. Led by European lady champion, in sparring and other aspects that can be chosen by the lady karateka. – Special youth groups. For kumite and sparring training, learning the best training methods when you are young and special attention for matters to be careful about. – Kihon and kata (own level). Background and explanation. Instruction on ways to create advanced knowledge for future examinations. – Self defense. Skilled (professional) instructors will instruct – effective – self defense for individual groups; youth, ladies, (elder) men. – And of course: in this Camp there will be a surprise training and a competition in which the winners can expect incredible trophies (and honour)! Especially for this camp: (future) fighters can ask for observation while training. Very experienced instructors will watch them and look for strong and still-to-improve aspects of their fighting. After the camp this will be discussed and there will be the possibility of an individual plan for training and developing skills. This is in co-operation with our national coach. Soon to be expected: detailed program of the Summercamp 2018! Start is Friday afternoon, finish Sunday afternoon.